Alexis Diaz is a Puerto Rican painter and urban muralist, known for his chimerical and dreamlike depictions of animals in a state of metamorphosis. Inhabited mostly by phantasmagorical animals, Alexis Diaz’s captivating murals are characterized by a very detailed technique and line-by-line precision. Diaz’s signature style is the use of tiny black brushstrokes on white to render his creatures, making them look like highly-detailed pen-and-ink drawings. These ‘drawings’ stand out all the more for being set against their bright teal, blue, and sunset-colored backdrops. He has a preference for wild animals, in general, more specifically those living in the Savannah, as he blends them in a fantastical image with creatures from the depths of the oceans, replaces paws with tentacles and wings with hands. 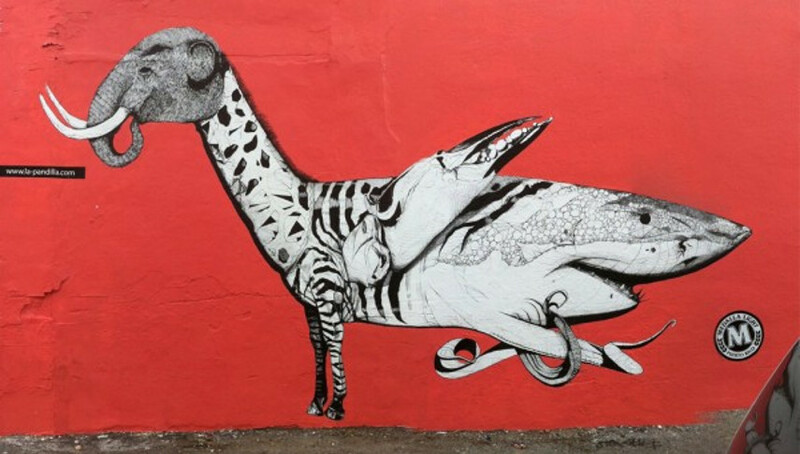 Alexis first began to create murals in 2010, alongside his friend Juan Fernandez aka JUFE. Both artists are known for intricate line detail, splashes of vibrant color and the melding of fantastical animal imagery. The street art scene in Puerto Rico was at the time very limited, only using typical spray cans, any other mediums were generally either completely missed or even frowned upon so Alexis felt quite limited. This was until he began to experience works by Keith Haring who was a big inspiration and encouragement, which finally led him to step outside aerosol and begin to paint the street using other means. Looking back, Alexis still can’t believe how art changed his life. “I quit my job and everything I was doing at the moment and for a year and a half I painted the streets of Puerto Rico without gaining a penny,” he remembers. 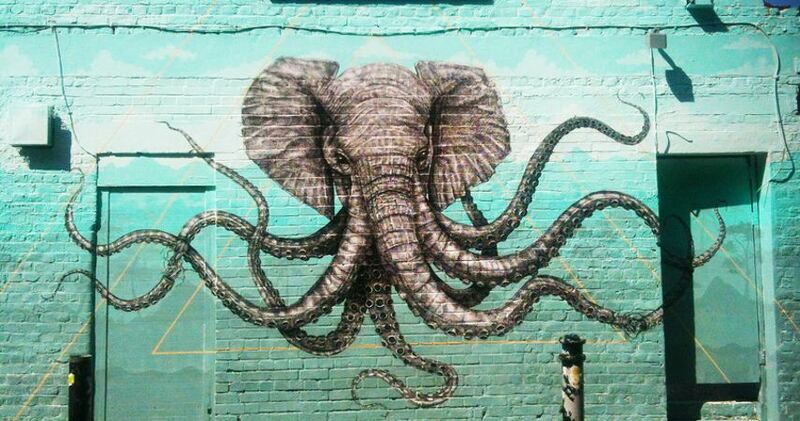 Now over 40 of his surreal murals can be found in more than two-dozen cities worldwide. And he keeps adding to the list: “This year I’ll be painting in New York, Budapest, Cozumel, Rome, Berlin, San Diego, Denver, Paris, and Sydney,” he says. Diaz often works collectively with a previously-mentioned friend and fellow street artist Juan Fernandez; when collaborating together, the group calls themselves La Pandilla (or The Gang). 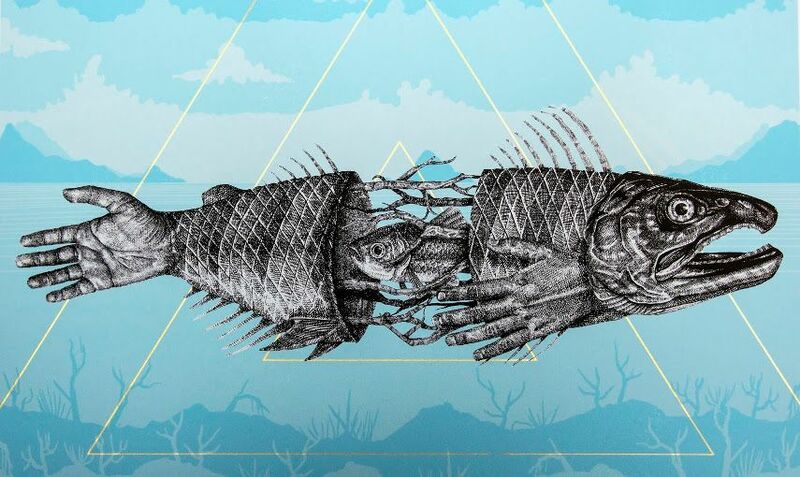 Both Diaz’s solo work and that of La Pandilla demonstrate a deep interest in transfiguration; animals morph into one another, human hands and skulls become wings and snail shells and creatures are transformed into ships and submarines to be used for the transport of other animal subjects. Launched by the Parisian street art gallery Galerie Itinerrance and initiated by the Tunisian-French artist Mehdi Ben Cheikh, Djerbahood is a spectacular open-air street art gallery project featuring hundreds of murals painted by 150 artists coming from 30 countries, all created in accordance with the authenticity of the place and all intended to be preserved so they can be enjoyed for the years to come. 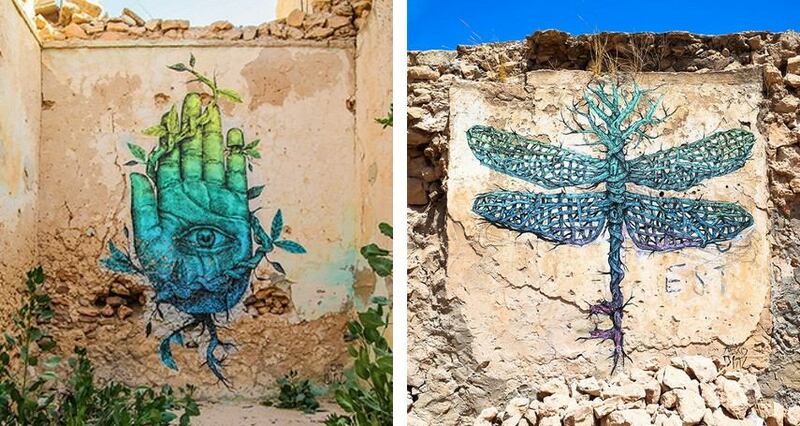 For the Djerbahood street art project, Diaz created two beautiful pieces crafted in his renowned meticulous style. The first one is titled Your hands build what your soul looks in which Diaz painted an ancient symbol of Hamsa, also known as Hamesh hand, depicting a protective amulet in the shape of a palm which is popular among both Jews and Muslims throughout North Africa and the Middle East. Second Diaz’s mural named Adaptation is a beautifully painted dragonfly which appears to be made out of twisted roots. Apart from numerous murals left by his hand on the walls of his hometown, Alexis Diaz brought street art to the city of San Juan on a whole new level – he co-organized an international urban art festival – Los Muros Hablan (translated as The Walls Speak), the first of its kind in Puerto Rico. During the event, neighborhoods that have seen hard times become canvasses for artists to create and showcase their work, transforming the area into an open-air gallery. 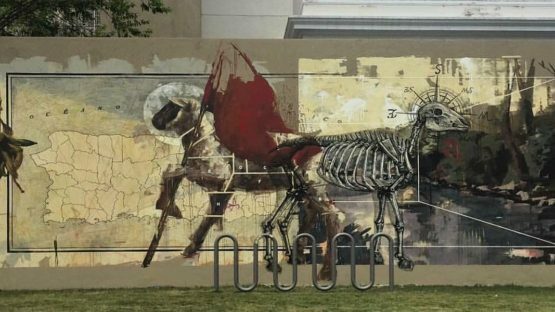 Through the years, Los Muros Hablan introduced some of the best-known artists to the streets of San Juan, including names such as Conor Harrington, Roa, DALeast, Faith 47, Aryz, Jaz, Axel Void, Interesni Kazki, and Inti, among many others. As the popularity of the festival grown, it has become an instrumental art experience for the community and one of the largest art festivals of its kind in the Caribbean. Ever since his popularity has grown, Alexis’ has been commissioned to paint murals in the cities as diverse as Los Angeles, Atlanta, Richmond and Miami and, besides the US, in Puerto Rico, Mexico, Argentina, South Korea and dozens of other countries. And just recently, Alexis Diaz presented his first ever sculpture. The sculpture produced in Diaz’s characteristic style and titled Hipocampo is created for Wynwood Walls during the Art Basel 2015 in Miami, Florida. What Alexis Diaz has to offer is a refined and meticulous aesthetic that is presented in a completely exuberant world. This art really stands out from the rest, both through its style and its inspiration; it is a neo-romantic type of street art, with steampunk trends. Alexis Diaz lives and works in Florida.